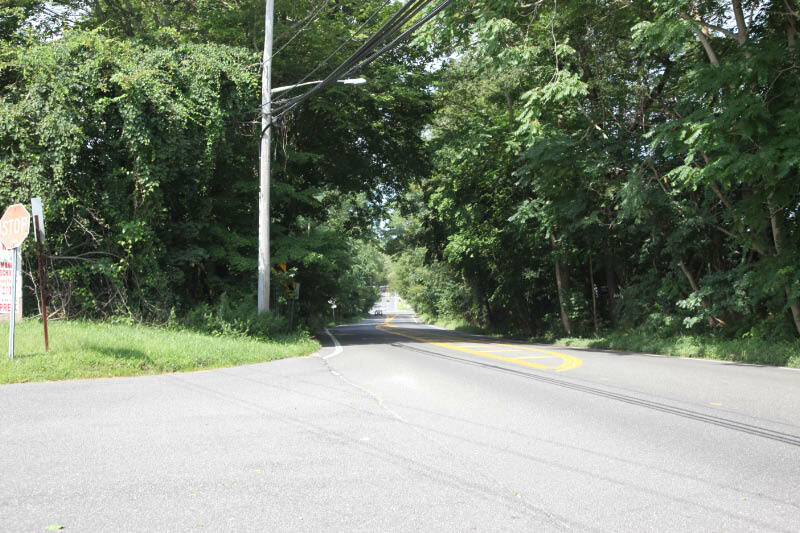 Drivers needed to turn left for Deer Park, Babylon and Merrick Road and right for Centerport, Northport and Jericho Turnpike. Oddly, there appears to be no road to the right. Assumptions: This is the Motor Parkway in the Dix Hills area with Deer Park to the south and Centerport to the North. Accordingly, the view was looking west. The road on the left appears to end at the Motor Parkway. Assumption: This was a southern entrance/exit to the Motor Parkway. 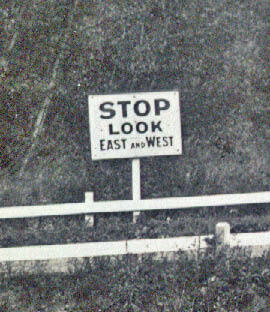 Another mystery: This sign reads "Stop Look East and West". Assumption: Since the view on the Motor Parkway was east looking west, the sign was warning of a nearby parallel road. Drivers needed to turn left to go to the Deer Park Speedway. There was also a racing event on Sunday, September 8. 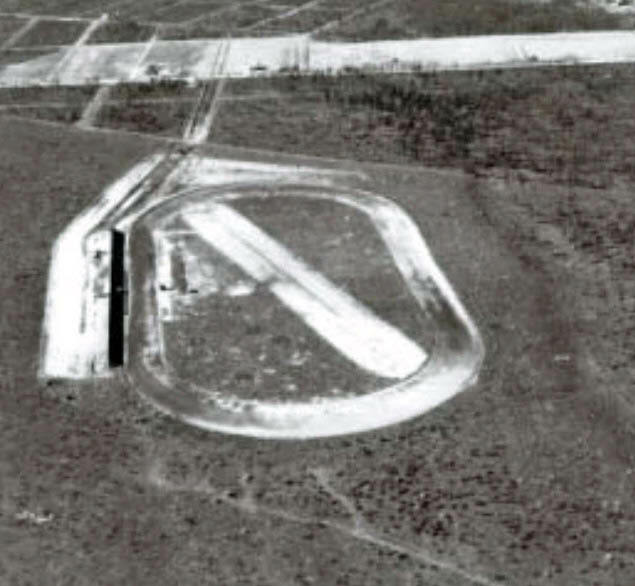 Facts: The Deer Park Speedrome was in operation from 1928 to 1947. During this period, Sunday fell on September 8th in 1929, 1935, 1940 and 1946. A diamond reflector was on the right side. The copy on the sign has not yet been deciphered by the CSI Team. Assumption: Confirmation the intersecting road did not continue north. Fact: The Motor Parkway turned south just west of Deer Park Avenue. 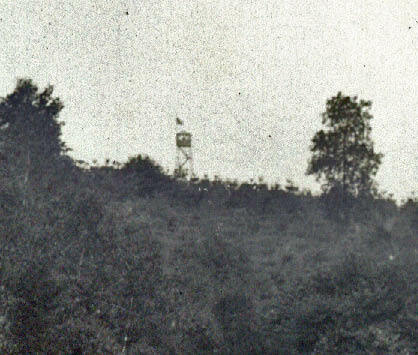 A fire watch station can be seen on the hill in the background. Assumption: There was a hill to the south-west of the location. 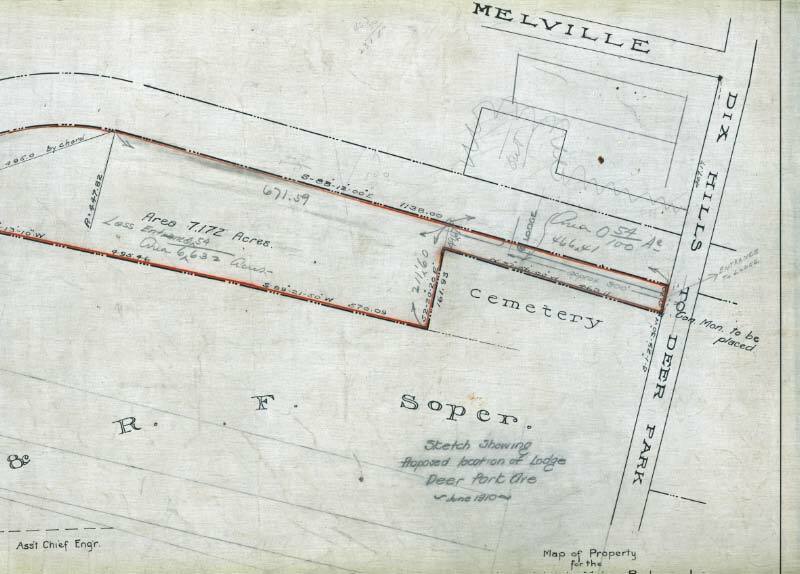 Assumption: Based on the Deer Park signs and the location of the speedway, the three possible intersections on the Motor Parkway were Half-Hollows Road, Deer Park Avenue and Carl's Straight Path. Fact: The most direct route from the Motor Parkway to the Deer Park Speedway (marked by the blue dot) was Deer Park Avenue. 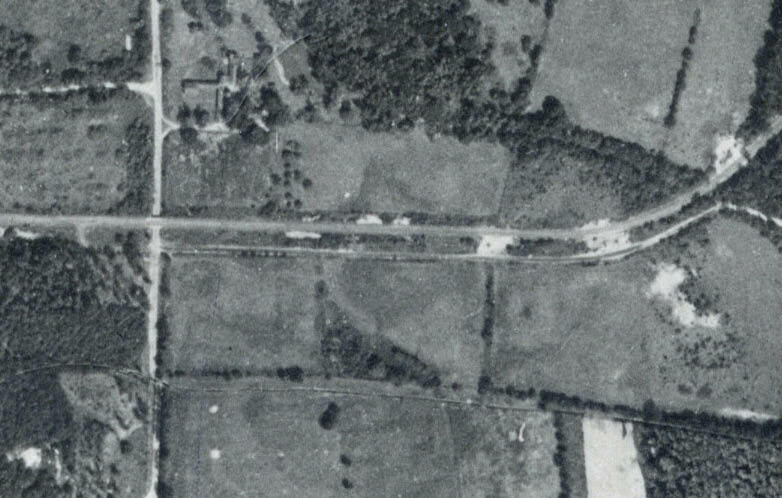 Fact: As seen in this 1931 aerial, Deer Park Avenue (seen across the top of the photo) was the primary entrance to the Deer Park Speedway. 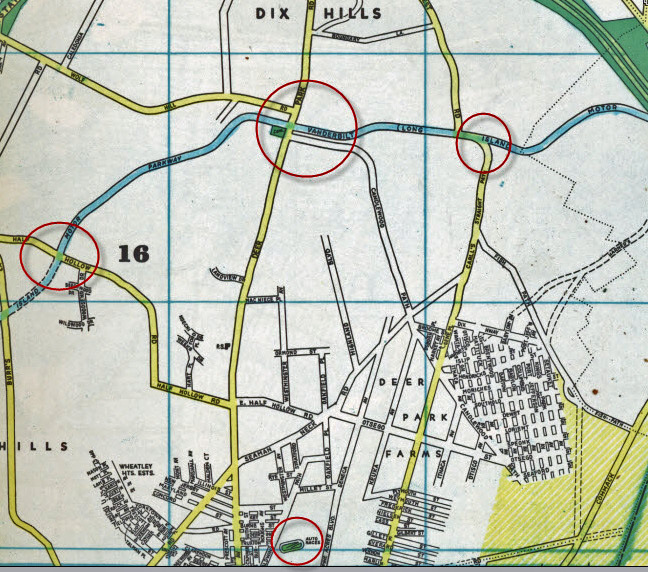 Fact: A 1928 aerial of Dix Hills rules out Half-Hollows Road and Carl's Straight Path based on the the road signs and the turn south. Fact: The only parallel east-west road to the Motor Parkway in Dix Hills was, and remains, Candlewood Path near Deer Park Avenue. Fact: As seen in this March 1910 survey, the Motor Parkway originally planned to build a lodge on the north-west corner of the intersection with Deer Park Avenue. The plan was changed to the south-west corner. Note: "Out" marked on the north-west diagram. Fact: A 300-foot road parallel to the Motor Parkway was planned as an entrance to the lodge and Deer Park Avenue. Although the Deer Park Lodge was listed on the south-west side of the Deer Park Avenue intersection on many maps, the lodge was never built. Fact: There was a southern entrance to the Motor Parkway west of Deer Park Avenue. Facts: There was also a possible southern entrance to the Motor Parkway east of Deer Park Avenue which became Candlewood Path. 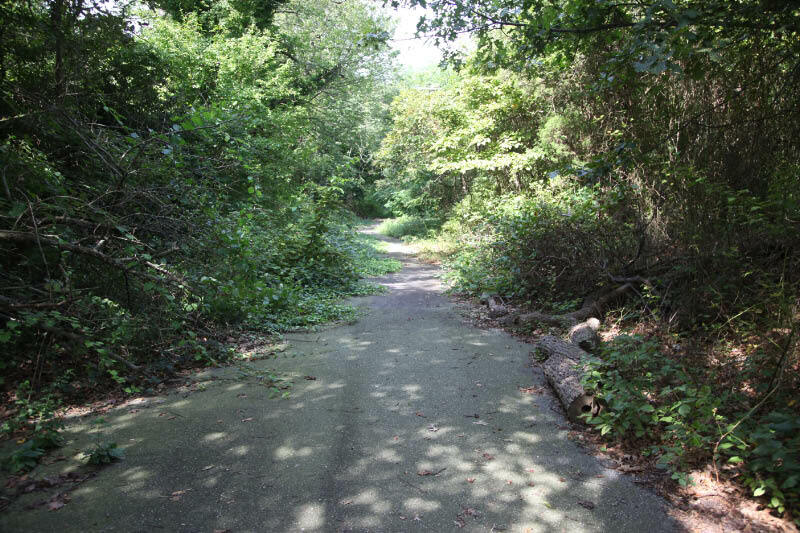 This path also had an entrance on Deer Park Avenue and ran parallel to the Motor Parkway in this area. Fact: Looking past Deer Park Avenue, the Motor Parkway heads up a hill and turns south in this 2012 image matching the mystery photo. 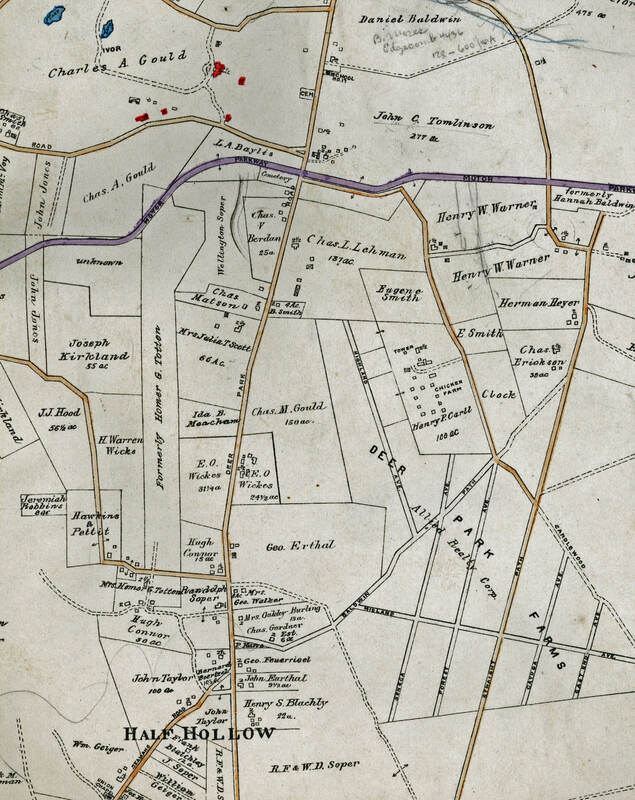 Note: The valley topography in this area enabled the Motor Parkway to go over Deer Park Avenue. 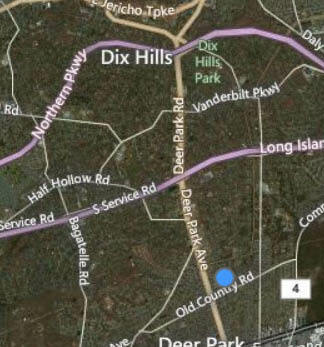 Fact: There is a southern entrance to the Motor Parkway (renamed Vanderbilt Parkway in Dix Hills) at Candlewood Path. 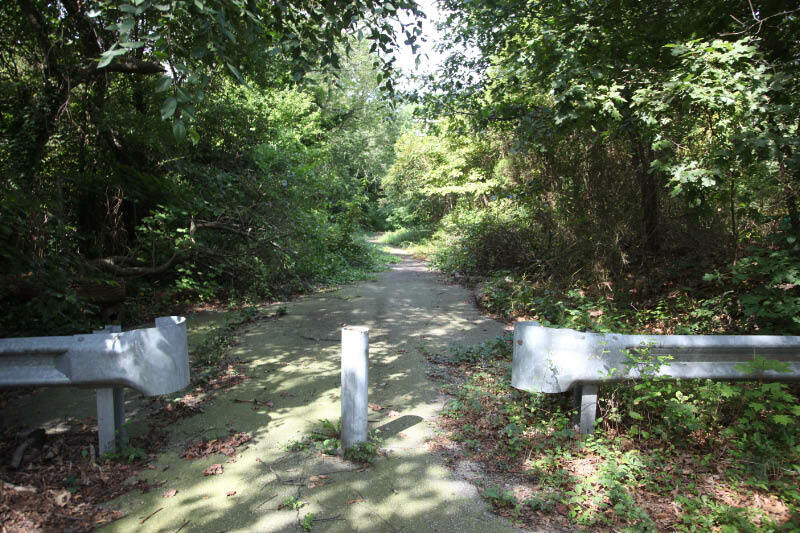 Fact: Remnants of an abandoned section of Candlewood Path lead to Deer Park Avenue. 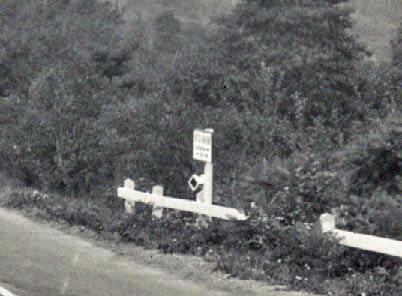 Assumption: This barrier was built in the 1940s to block traffic from entering Candlewood Path from Deer Park Avenue. 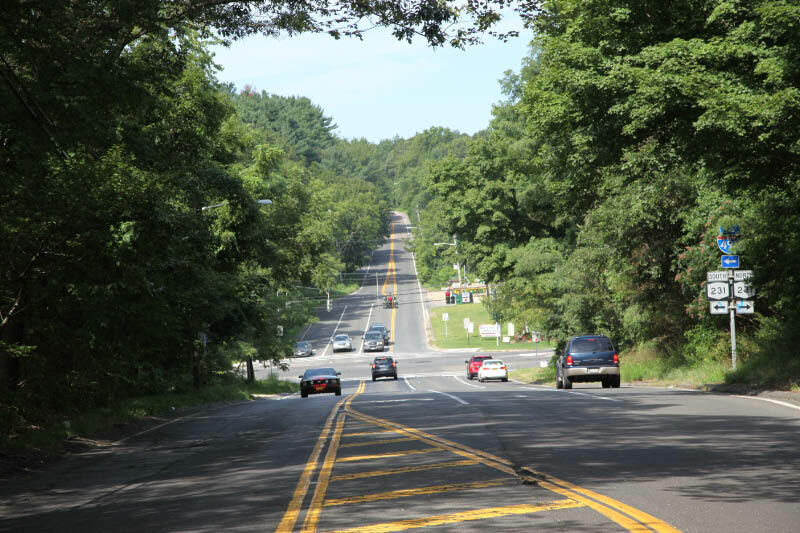 Based on the above facts and assumptions, the CSI (Cup Scene Investigation) Team concludes that this photo is the Motor Parkway looking west in Dix Hills, most likely west of Deer Park Avenue. It was used to connect to Deer Park Avenue when the Motor Parkway bridge was still in use. 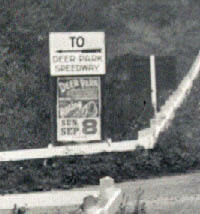 Based on the Deer Park Speedway "Sunday September 8" event, the photo was taken in 1929, 1935, 1940 or 1946. The same view in 2012 from location west of Deer Park Avenue. Note the matching topography and distances to the next turn in the Motor Parkway. It may also be possible that the photo was taken east of Deer Park Avenue. 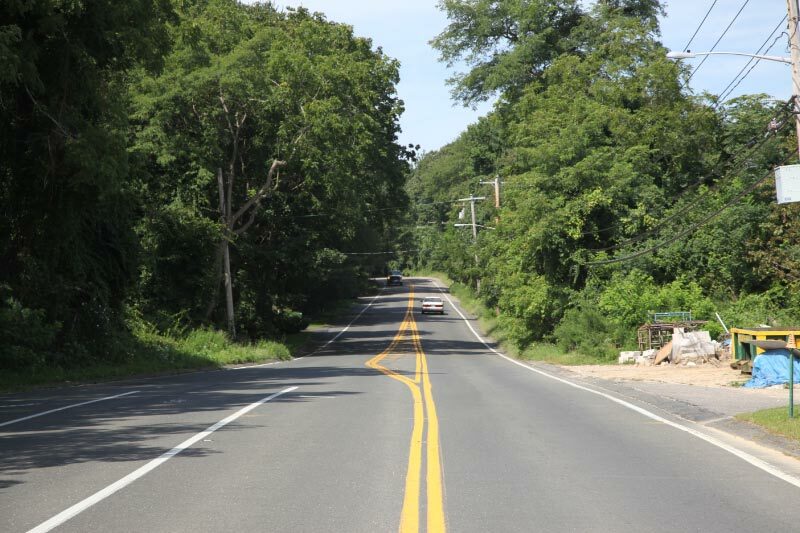 This 2012 view of the Motor Parkway shows Deer Park Avenue in the background with Candlewood Path on the left. 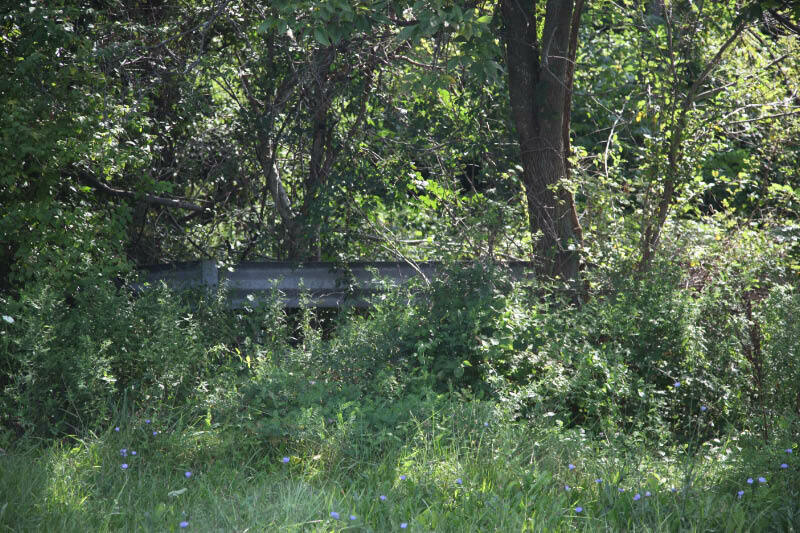 However, the next turn in the Motor Parkway is far in distance and does not match the CSI photo. Congratulations to Joe DeBono and Kenneth Harris for identifying Deer Park Avenue as the location for the CSI photo. Joe and Kenneth, please send your email address to Howard@Kroplick.com and you will receive autographed copies of "Vanderbilt Cup Races of Long Island" and "Long Island Motor Parkway." Kudos also to Mike for posting a correct possible date fro the photo. Nice work by the CSI team! You never cease to amaze me. Every day, we seem to learn more and more about the Motor Parkway. Thanks for all your work. Amazing . I used to drive this section(Ronkonkoma to Fox Lane almost every day in the 70s and 80s) those old pictures literally gave me the chills. Great work CSI team. “I can recall Candlewood Path having open access to Deer Park Ave until the mid 1960’s at the location adjacent to Deer Park Ave. I think they closed it after there were too many accidents, it was a very confusing intersection, especially after the 1965 or so widening of DP Ave. There is no doubt that the location is correct here… I also used to play at the abandoned DP Speedway and some old guy would shoot BB’s at us when he saw us on the property. It was redeveloped in the late 1980s. The barrier that’s at the end of Candlewood Path over by the Methodist church at the intersection of DPA was NOT put up in the 40’s….My dad clearly remembers hooking that turn when they were building our house down by St Matthew’s church back in the early/mid 60’s…. I recently visited the area where this southern entrance would have existed to see if I could find any “artifacts”. I have to say I find it hard to believe that the entrance in the photo could have been west of DPA. If that’s true, it almost certainly would have cut through the historic cemetery that still exists there, which I also checked out. That doesn’t seem likely and the “terrain” around that cemetery isn’t very conducive to an off-ramp in any case. There’s also no parallel road to Vanderbilt Pkwy on the west side of DPA, so that “look east and west” sign would probably have been unnecessary on that side. Finally, if that entrance / exit is on the west side, the signs should be facing the other way (and the arrows pointing the opposite way), as you would have to make a left to go to Centerport and a right to go to Deer Park when approaching DPA from the west. 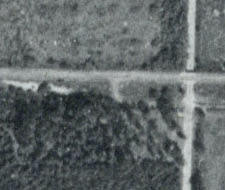 The old aerial photos here don’t show any parallel roads west of DPA either. Candlewood Path is east of DPA, so if that’s the road in question, the southern entrance would have to also be east of DPA, unless that was also a “bridge” over DPA so to speak. I admit the mystery photo probably is Vanderbilt going over DPA facing west. I’m just a bit lost on where that southern entrance could have been. 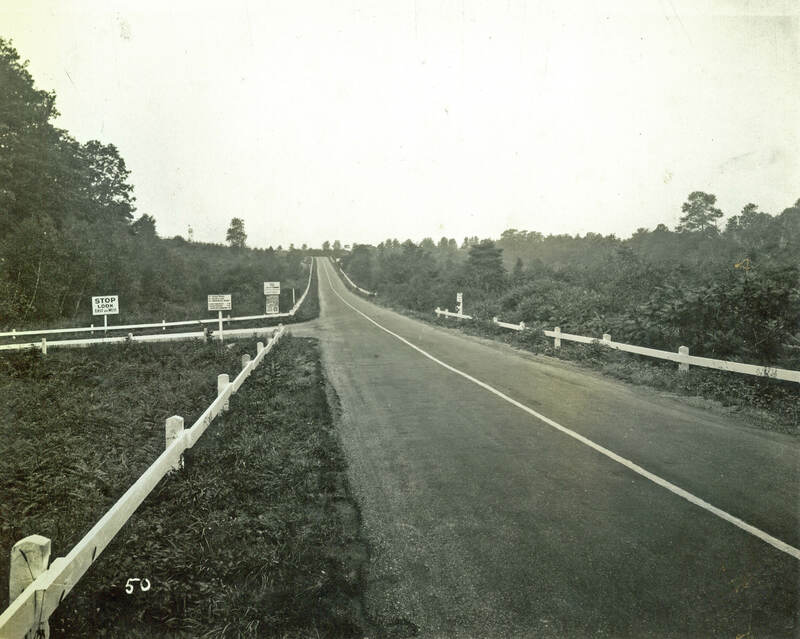 My “theory” is that it was an access road to Candlewood Path (and ultimately DPA) from the LIMP that was located east of DPA, but closer to it than the Vanderbilt / Candlewood intersection of today is…..but that’s just a guess. 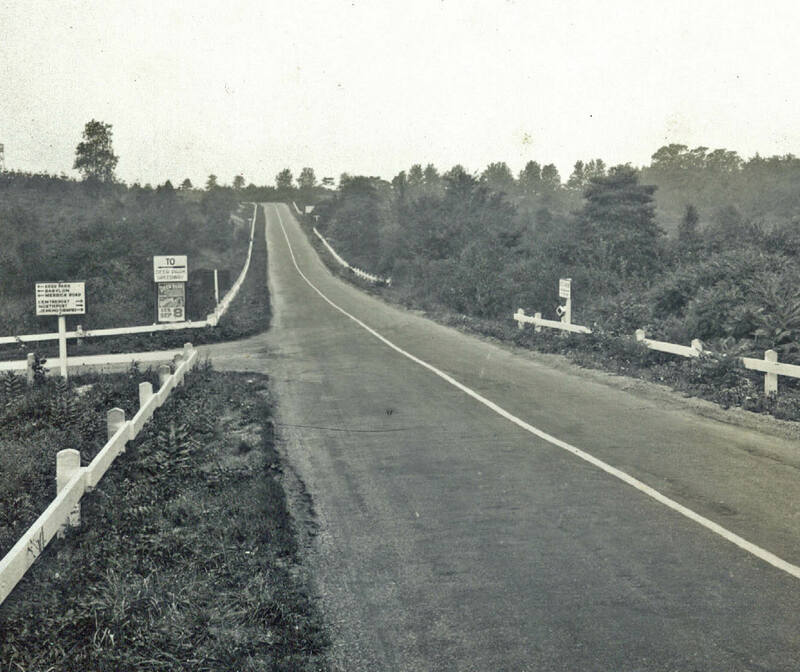 I think the “valley” of the present day Vanderbilt Pkwy is somewhat less pronounced in the photo due the bridge that’s there instead of the intersection of today. None of the aerial photos appear to show evidence of any entrance to the LIMP in that general spot that I’m seeing, but there is no close-up there either so I don’t know. Some things about this remain a mystery at least to me. BTW, I lived on it, near Half Hollow road, growing up. OK, I am officially flip-flopping. You’re probably right and my “theory” belongs up there with Ptolemy’s that the Earth is the center of the universe. A friend directed me to “historicaerials.com”. There I punched in “500 Vanderbilt Parkway Dix Hills New York” in the search box. 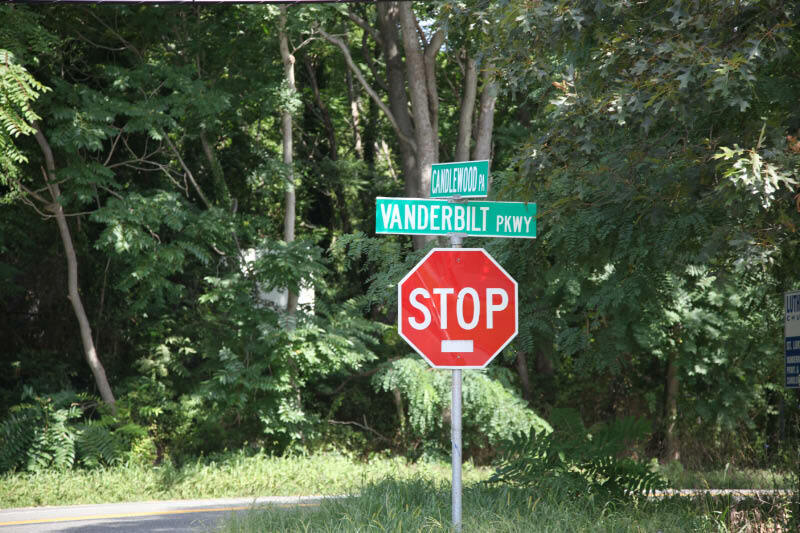 I don’t know what house that is, if any, but I know it would be around where the DPA / Vanderbilt intersection is. 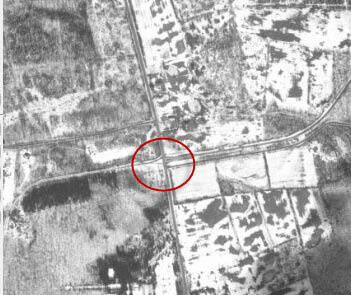 A 1954 aerial clearly still shows a side access road running between the LIMP (or whatever they were calling it in 1954) and DPA…..WEST of DPA. 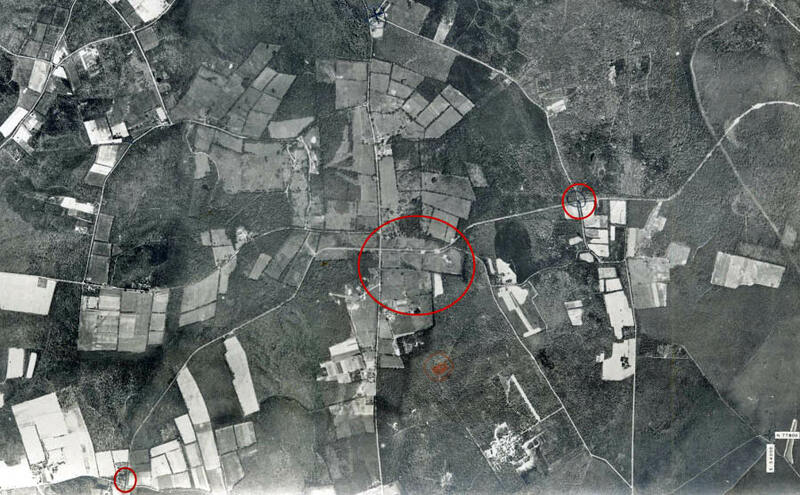 Probably not still in use in 1954, but still visible in the aerial. What’s more this road (on/off ramp?) appeared to hit DPA directly across from where Candlewood Path hit DPA on the east side back then. 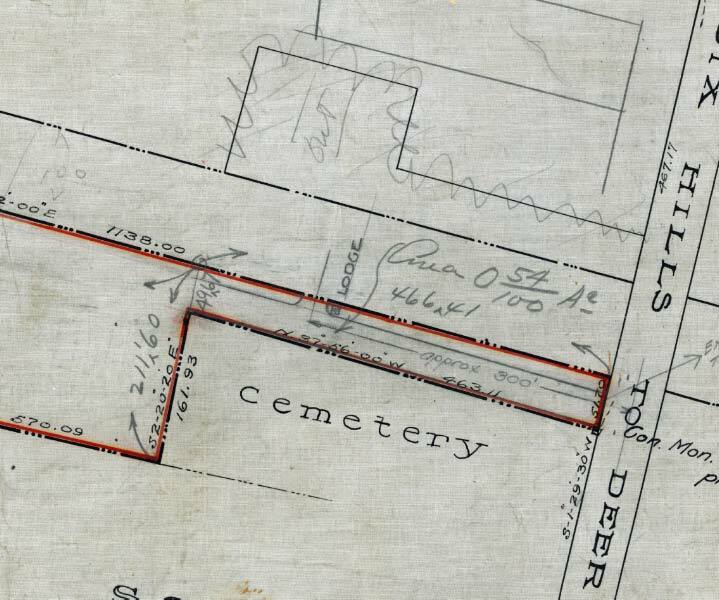 Thus, it appears to have run BETWEEN the LIMP and the location of the headstones in the historic cemetery. The cemetery is now fenced in, including where that ramp would have run, so I was thrown off by that. I didn’t consider that in 1937, or whenever, that fence may not have been up, and that the former LIMP ramp may have been added to the cemetery property by the town after the LIMP closed. Perhaps the “coolest” revelation in all this is that the current entrance to this historic cemetery is very likely that same former entrance to/from the LIMP, as it is situated directly across from the barrier put up to close the Candlewood Path entrance from DPA (probably in the 1960’s as Jeff above states, as it was still connected to DPA as of 1954 in the aerial). The entrance does consist of some old pavement but is quickly overtaken by nature as you walk onto the property. I bet some pavement could be excavated, but digging in a cemetery without permission from the town is probably not a good idea for obvious, and some not so obvious, reasons. I’m still confused by some of the signage, such as why they thought people should stop there and look east and west before proceeding, unless it was to yield to possible cemetery visitors. There was no other road near where that sign is according to the aerial I saw.